My sister just moved into a new place . . . her first one-bedroom apartment. 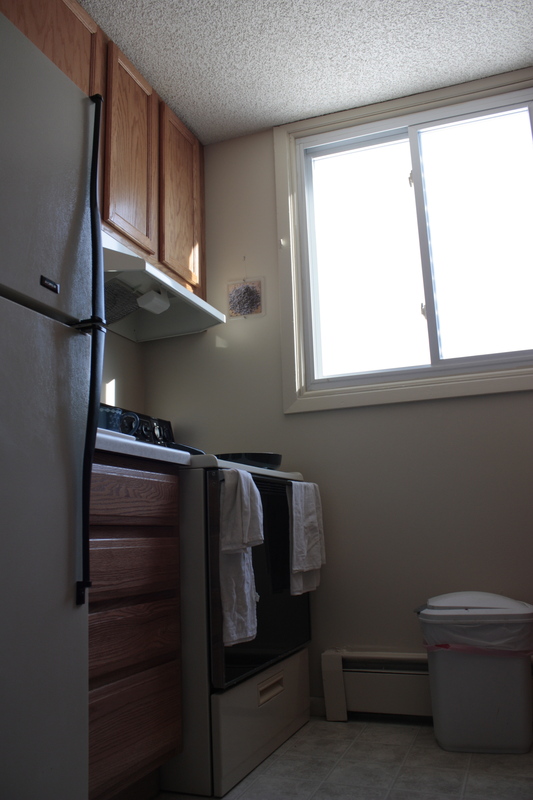 She was living in a teeny tiny efficiency apartment with a kitchen that was smaller than my bathroom. Hell, the kitchen was smaller than her bathroom. The whole place was roughly the size of my living room. But that’s over now and she moved into a nice, medium-sized one bedroom in the suburbs of Minneapolis. And she has what I would consider a real kitchen now. It’s still on the smallish side, but workable. It is a bit under-furnished compared to my kitchen. But most people’s kitchens are, especially if they’re not wanna-be gourmet chefs like yours truly. Her kitchen has the basics. 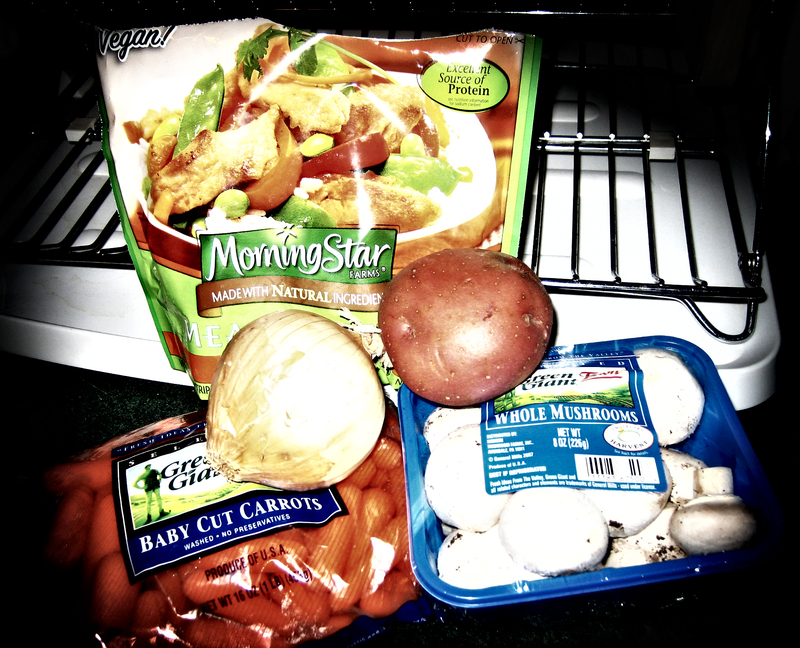 Which means I was back to cooking simple, supermarket friendly vegan food. 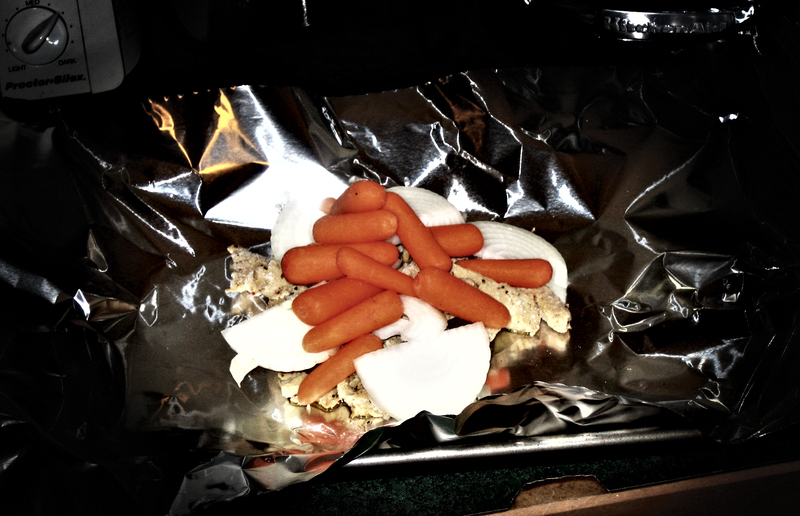 With no fancy appliances or co-ops that my sister was willing to drive me to, I had to cook with what was there. And what was there ended up being the components to one of the best meals I’ve made in a long time. I normally don’t like Portabellas. I find them boring, cliche even. I usually go for more interesting sandwich fillings . . . tofu with exotic marinades, sietan sliced thinly and grilled, sliced avocados, et cetera. Portabellas are so pedestrian. Every restaurant uses them to placate vegans because they don’t know what else to cook. And then they butcher the preparation, leaving them whole so it feels like biting into a hunk of organ meat. Ugh . . . My bad past experiences have led me to avoid them ever since. The day I came up with this recipe, something struck me. It’s easy. It tastes good. The ingredients are readily available. And it’s certainly not your typical, pedestrian, just plain bad portabella mushroom sandwich. That, and the side dish: rosemary roasted fingerling potatoes balances out the strong, salty mushroom. They have almost a creamy texture and flavor. The potatoes couldn’t be simpler. They hardly warrant a formal recipe. I never use one, anyway. Get a bag of fingerling potatoes. I’m not sure what size. It looked like a pound or a pound and a half . . . something like that. If they’re the fat kind of fingerlings, cut the big ones in half lengthwise. Otherwise, just leave them whole. Preheat your oven to 425 degrees Fahrenheit. Throw the potatoes into a bowl. Pour a few tablespoons of oil over them, a combination of olive oil and canola oil. (We’re roasting these a bit too hot for just olive oil alone.) Sprinkle liberally with salt and pepper. Add 1-2 teaspoons of rosemary, crushing it with your fingertips. Toss all this together. Dump it into either a 9×13 pan or a large, rimmed sheet pan. 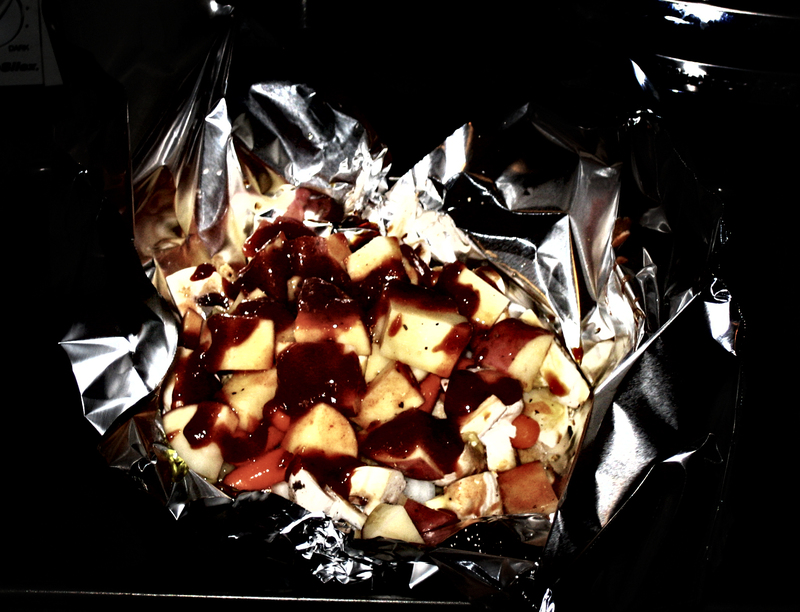 Roast for 20 minutes. 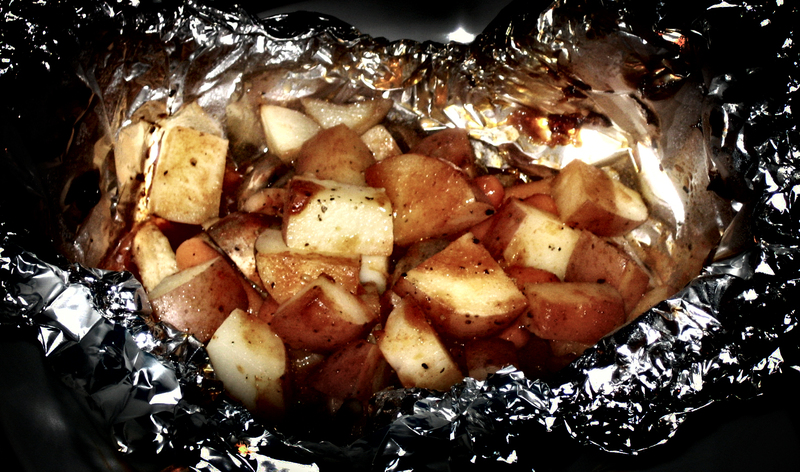 Stir them around and roast for another 5 to 15 minutes, depending on how thick your ‘taters are. TA DA! They’re done. Eat ’em up! As for the Mushroom sandwich . . . that’s a bit more complicated. Grate the ginger and garlic with a microplane or other fine grater over a small bowl. 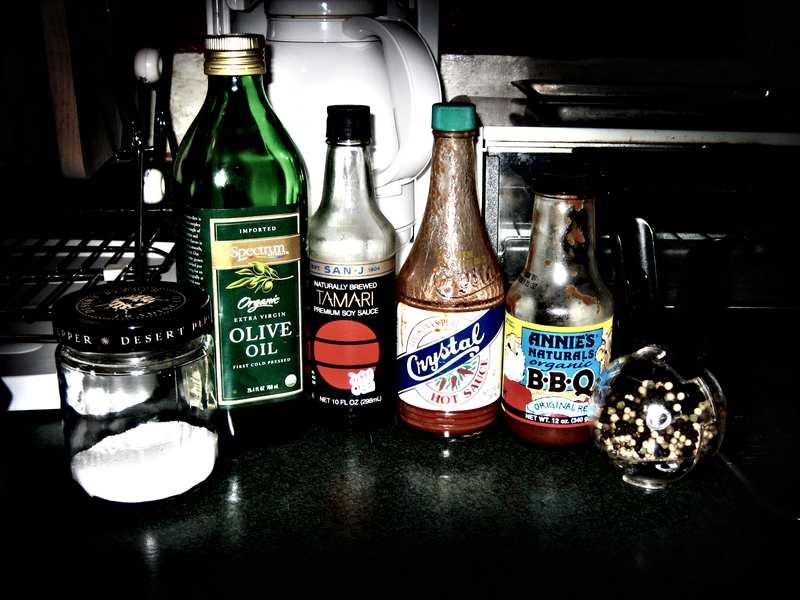 Add the rest of the marinade ingredients and whisk together. The onions and shrooms are almost done! Heat a large skillet over medium heat. Cast iron works best, but nonstick is okay, too. If you’re using cast iron, add a little bit of extra oil here, a couple teaspoons should do. When it’s good and hot, put the mushrooms in, gill-side down first. 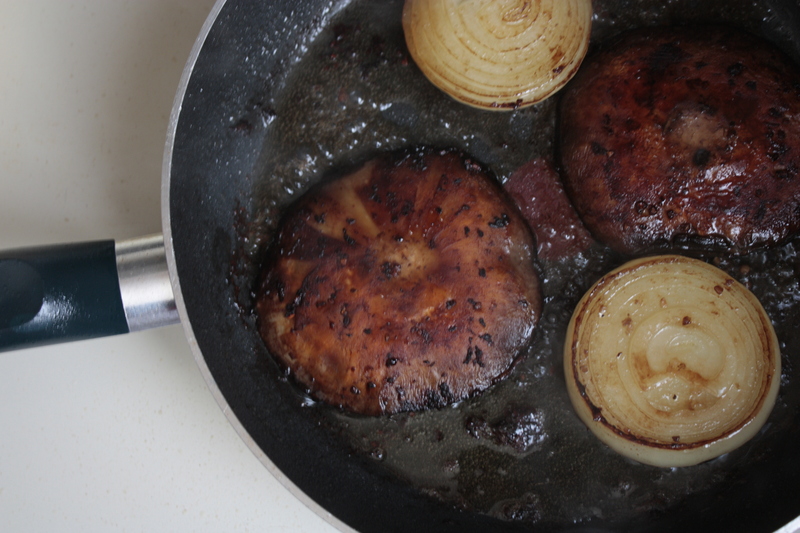 Next to the mushrooms, put two slices of onion in the pan. This is a good time to warm up your bread in the oven . . . which I definitely suggest. Let the mushrooms and onions cook undisturbed for five minutes and then flip everything over. 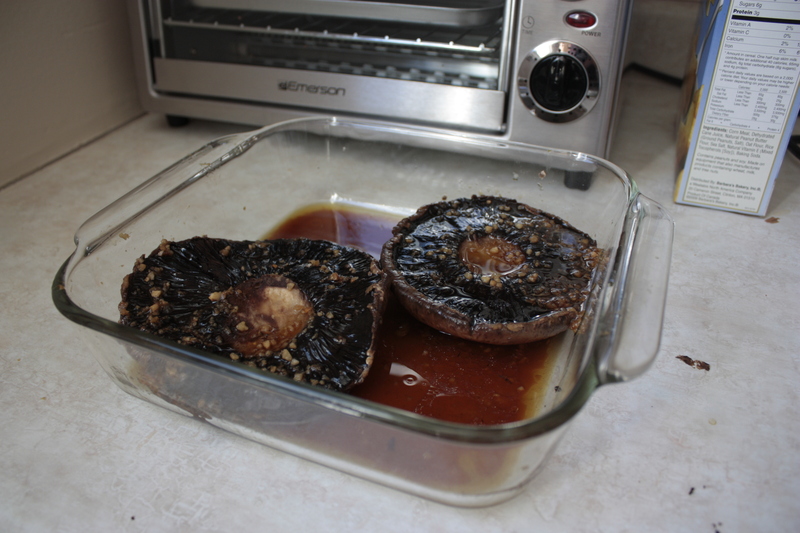 Let this cook for 4 to 5 more minutes depending on the size and freshness of your mushrooms. When the portabellas are done, they should be nice and golden brown on the top like in the above photo. Move the onions and portabella caps out of the pan and on to a cutting board to let them cool a bit. This is when I slice the tomatoes and take the bread out of the oven and cut it into sandwich-sized chunks and split it in half. I usually get 3 or 4 sandwiches out of one loaf of ciabatta, depending on how big it is. This recipe is only for two sandwiches, so you’ll have leftovers. You can use ciabatta rolls, if you like though . . . anyway . . .
Slice the portabella caps on a bias. Meaning, cut them into strips, but hold the knife at roughly a 45 degree angle against the board. It’s easiest to use a fork to hold the mushroom in place while you cut it. Brush soft interior of the ciabatta with olive oil. 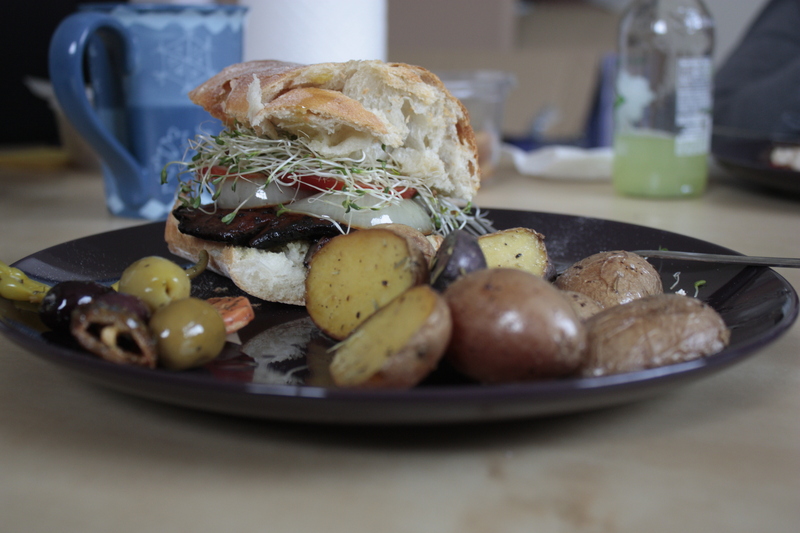 For each sandwich, place a sliced portabella cap, a few rings of onion (probably not the whole slice), two or three slices of tomato, and a good fat pinch of alfalfa sprouts. Cap the sandwich and eat! Om nom nom . . . This recipe makes 2 sandwiches. 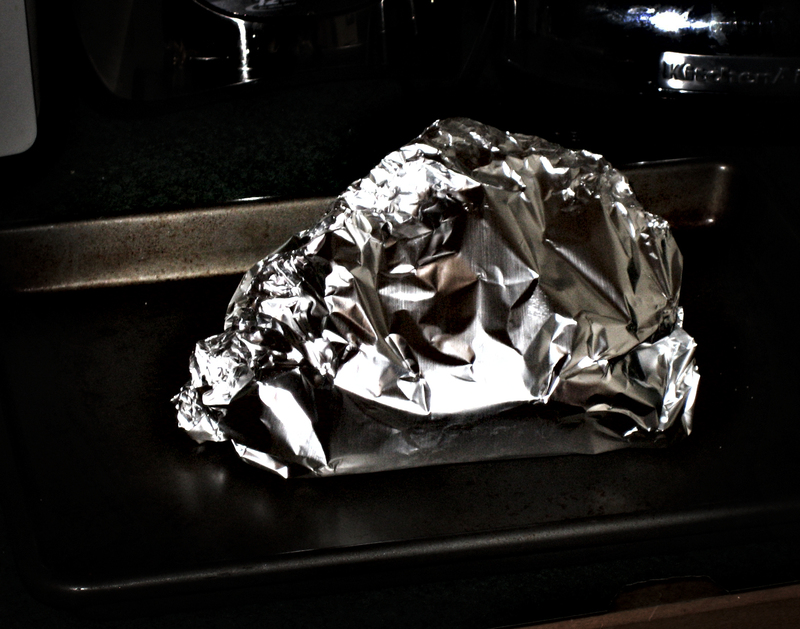 If you’re making the roasted potatoes with this sandwich, it’s best to start the mushrooms marinating and then deal with the potatoes and get them in the oven. 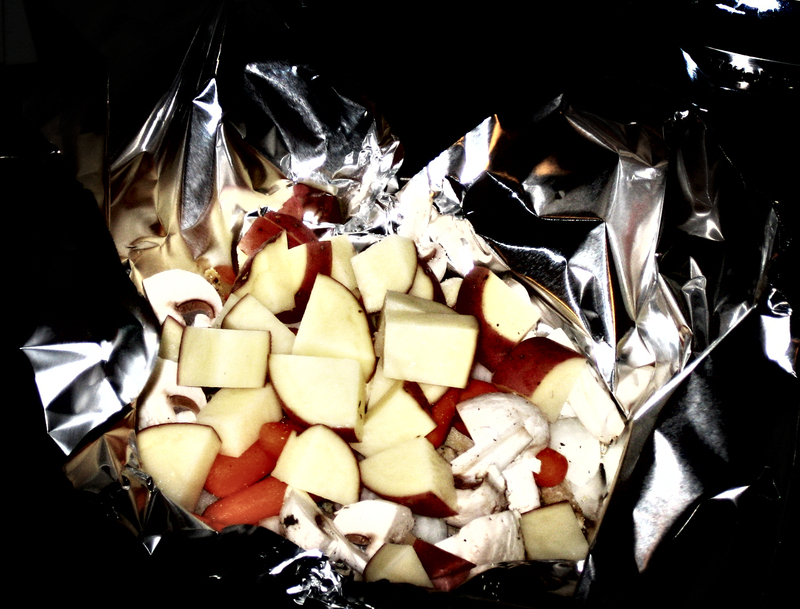 Once the potatoes have baked for 20 minutes, you can put your mushrooms and onions in the pan. Then it all comes together quite nicely. My sister and I ate the sandwiches and potatoes with some olive salad we picked up at the grocery store. The supermarket close to her place has an olive bar . . . and we loooooove olives. 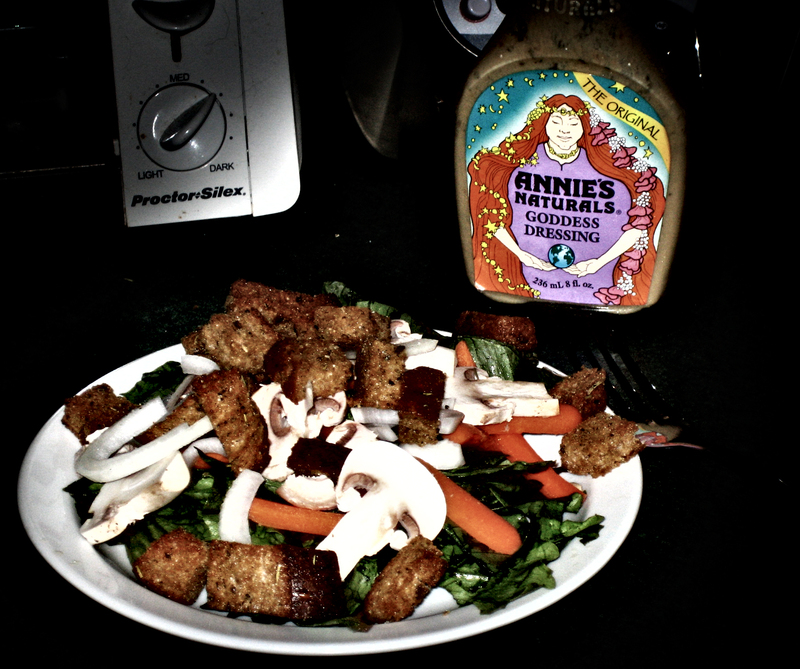 Feel free to substitute this with some green leafy salad or other salads.